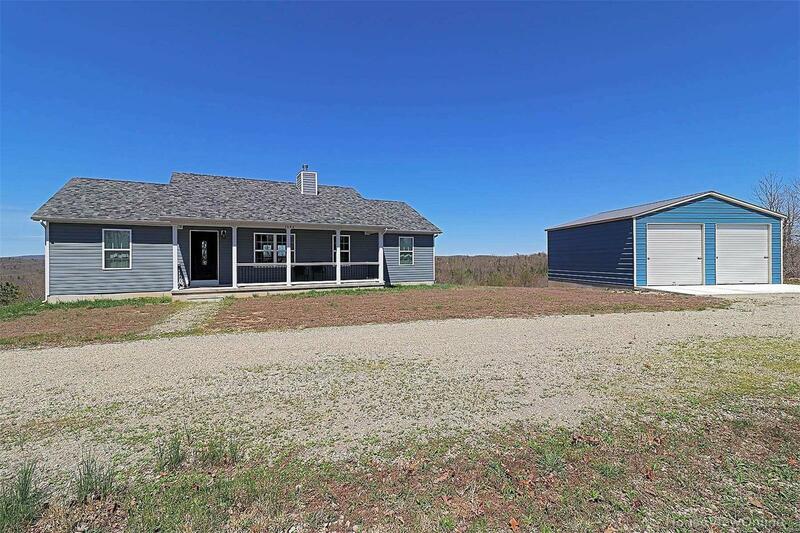 Four year old 3 bd/2 ba ranch home on 10 acres with a million dollar view over the hills of Madison County. It offers privacy and seclusion, plus a new detached 2 car garage, but lies only a mile from Hwy 67. Vinyl sided, low-maintenance home offers hickory wood floors in open plan living/dining/kitchen area. Living room has wood-burning F/P insert with blower, and TV mounting bracket above. Kitchen has custom cabinetry and a large center island, plus a huge pantry. Stainless appliances stay. Divided bedroom floor plan. Large master suite with tray ceiling, walk-in closet, and bathroom with dual sinks and custom over-sized shower stall with seat. Main level laundry room. There is also a full, partially-finished walk-out basement, with walls already studded for a 4th bedroom, 2nd bath, and family room. Home has a very efficient Geothermal heating and cooling system - total average electric bills only $120/month. Private septic and 347 ft drilled private well.